Identifying Different Classes of EVPs. The Old Hamilton County Jail. 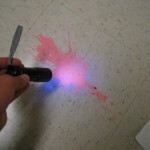 One Response to Using a UV Flashlight in Paranormal Investigations. Not only for the reasons you stated, but for this also: full-spectrum cameras require a source of illumination in the range of spectra to which they are sensitive or they will fail to capture non-luminous phenomena. Ghosts that are otherwise invisible to the naked eye may be visible in infrared or ultraviolet light, but not if there is no source of this light with which to illuminate them. So, unless an entity is radiating ultraviolet light, you need an ultraviolet light source for your full-spectrum camera to see it, or else the entity remains invisible.